[New for August 2015] To be honest, I'm not sure if the thought of the August blizzard of the month excites me or not. 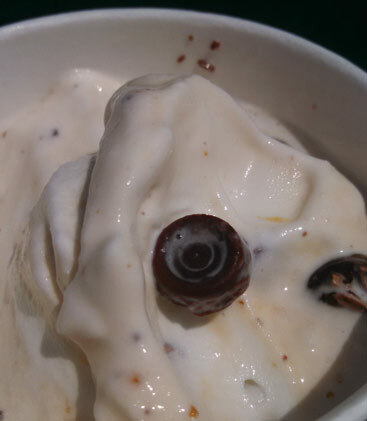 We had that disastrous Rolo McFlurry four years ago plus I didn't have much luck with my own mini rolo sundae either. I guess I'm not stoked by this idea, but I'm not scared either. I mean, it's a DQ blizzard involving candy, so it can't be that bad. I was expecting more caramel coloring, but the bits of caramel everywhere are cool. I take my first bite and it's a fine blizzard. In fact, I finish it without incident. We've got enough Rolo-like caramel flavoring, we've got plenty of intact mini Rolos to chomp on, and I'm sitting here on a beautiful day with a nice breeze keeping me cool. So, I'm not wowwed, but I'm pleasantly full none the less. I think the secret to keeping this blizzard balanced is are the tiny cups. I was expecting the mini Rolos you can buy at the grocery store, but these are like half the size of those. I don't think regular minis would have worked as well... you may have gotten more broken chocolate chunks all about, but you wouldn't have enjoyed a complete Rolo experience on just about every spoonful. 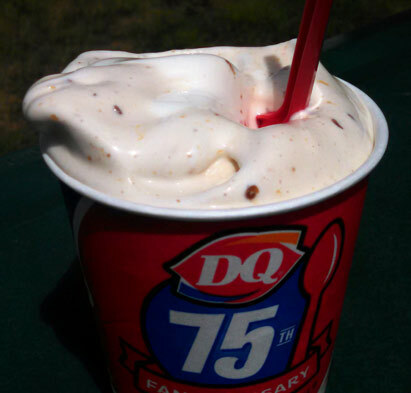 Alrighty, so, a fine blizzard to try if you like caramel or Rolos. Nothing crazy, just a pleasant way to wrap up Summer (sorry, why did I just say that?). 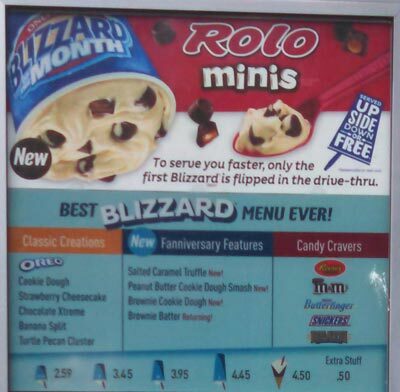 Side Note: Last Summer, DQ Canada had a peanut butter Rolo blizzard, as in peanut butter filled Rolos, as in why can we not have nice things America? Are we too busy pumpkin spicing everything? Is Dubba gonna review the other 7-Select flavor he shared in that twit pic? WE KNOW YOU BOUGHT IT. ugh.. i'd so much rather try the canadian pb one! regular rolos don't really do much for me. @aol: twitter pic was sent to me, but don't worry, I will review the others! @K: need pb rolos in my life!